Senaka achieved early fame as a child prodigy, whose work was first exhibited in Colombo in the late 1950s. He then held his first international one man show in New York at the age of ten. He continued to paint and as a teenager held numerous exhibitions in Sri Lanka as well as Europe, the USA and Asia. It was after he received formal training at Yale University, where he studied Art and Architecture, that he decided to dedicate his life to painting. After graduating he moved back to Sri Lanka, where he has since established himself as one of the region's most important living artists. His recent work is inspired by the plight of the Sri Lankan rainforests, many of which have been subject to intense deforestation to make way for tea-plantations. Senaka comments; "My main focus is on the endangered flora and fauna in our rainforests. 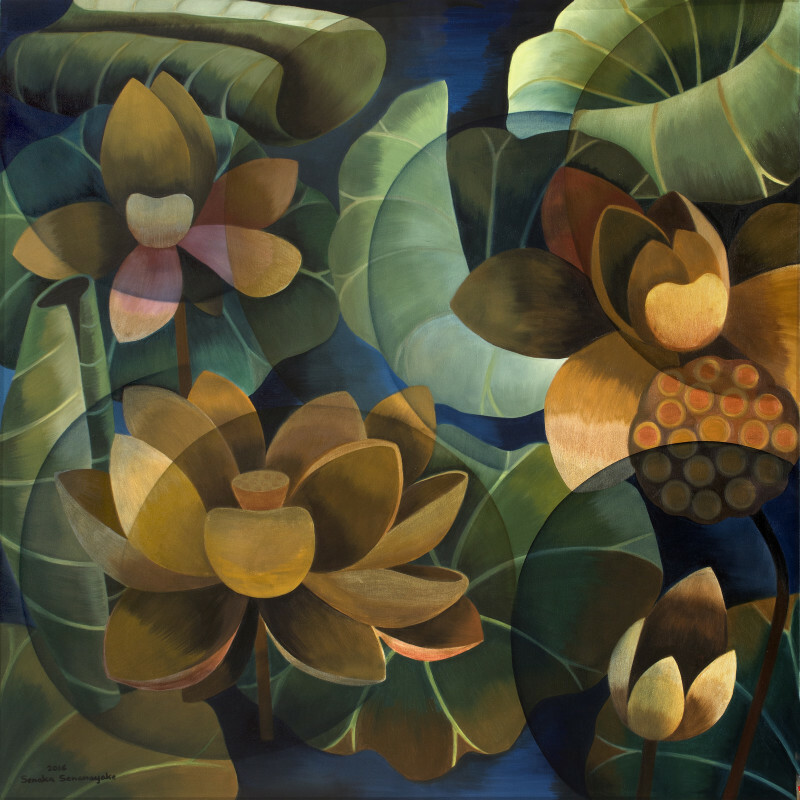 In 2005 I visited a rainforest in Sri Lanka, which had became my muse for many of my shows." Visiting the artist's house in Colombo it is easy to see from where Senaka draws inspiration for his wonderfully vibrant canvases. His studio is next to the house in which he grew up, and is surrounded by a lush tropical garden, full of exotic plants which attract colourful birds and iridescent insects. When discussing his work the artist comments "I could have shown the negative aspects of destruction, such as people and animals dying, but I try to do happy, positive paintings." One of Senaka's objectives is to establish a connection with everyone that encounters his work. "Many times, people walk be a piece of art and don't respont… I want my paintings to talk. Everyone from a street sweeper to a university professor should be able to relate to my art." Each of his canvases takes between 2-3 weeks to complete. Layer upon layer of paint is added, creating an incredible depth to the colours and imparting a rich feel the works which appear to have an almost luminescent quality to them.